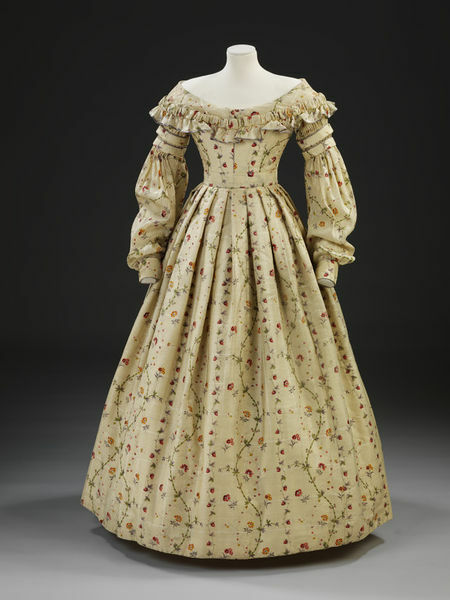 I was researching ball gowns from the 1860’s when I came across this dress on a blog. It was mislabeled and not what I had been looking for but I didn’t care at all because it was so pretty. I’m not sure what attracted me to it so much, it’s nothing like anything I’ve made before shape wise, it doesn’t require any fancy trims, and it’s floral! But despite all that, I loved it. And I wanted to make something like it more then anything else. This is the beautiful pile of material, more photos of it and information can be found here. Photos above are property of Victoria and Albert Museum. 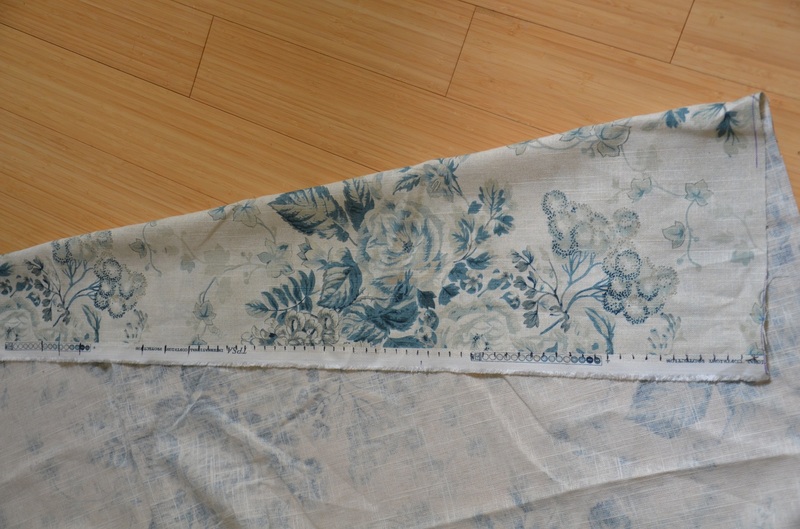 I actually purchased material with this dress in mind several weeks ago, you may remember it from my Fabric.com haul, it’s this lovely blue and ivory printed linen. I know it’s very different from the material used on the original, both in color, texture, and print size. 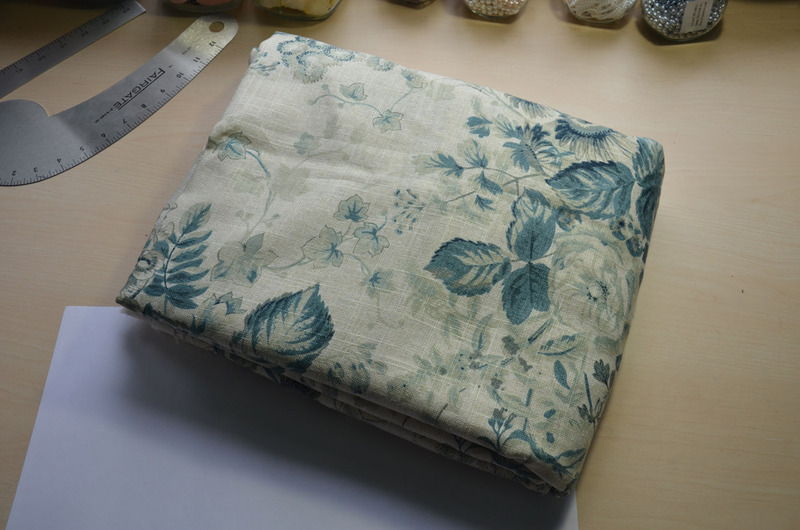 I tried to find something similar but failed – so I decided to use a fabric I really loved instead, even if it was different. 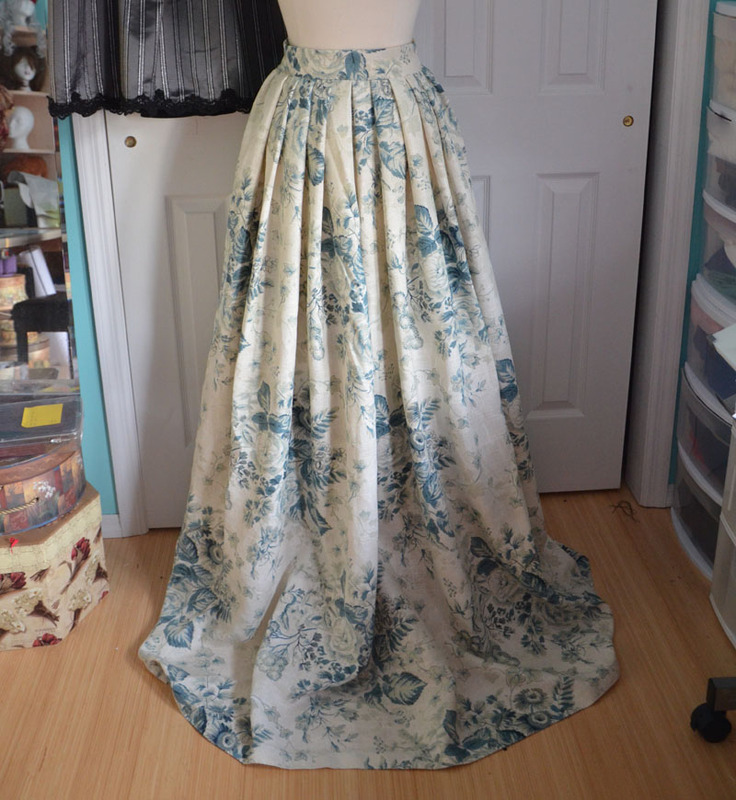 I started by draping the bodice pattern on my dress form. This went surprisingly well, I got the shapes I wanted right away. 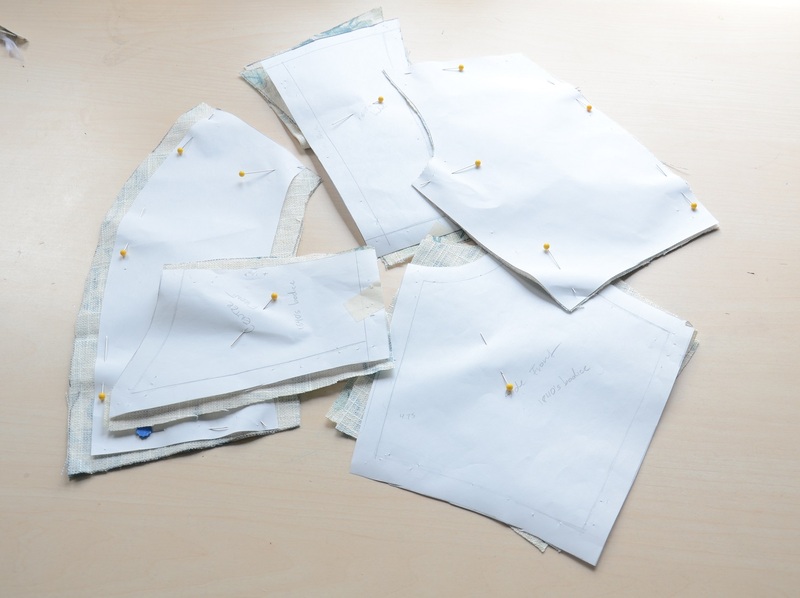 I took the pattern off my dress form and added seam allowances. Then I cut out my mock up. The mock up also turned out really well! I had to make a few adjustments at the shoulder but for the most part it was perfect. 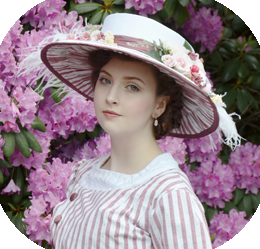 I made the slight alterations and cut my bodice pattern out again, this time from the floral linen. This is the longest i’ve ever spent cutting out a pattern, since I was so picky about the placement of the floral design. I didn’t want them to match up exactly, but I wanted the pieces to have even amounts of design and color. 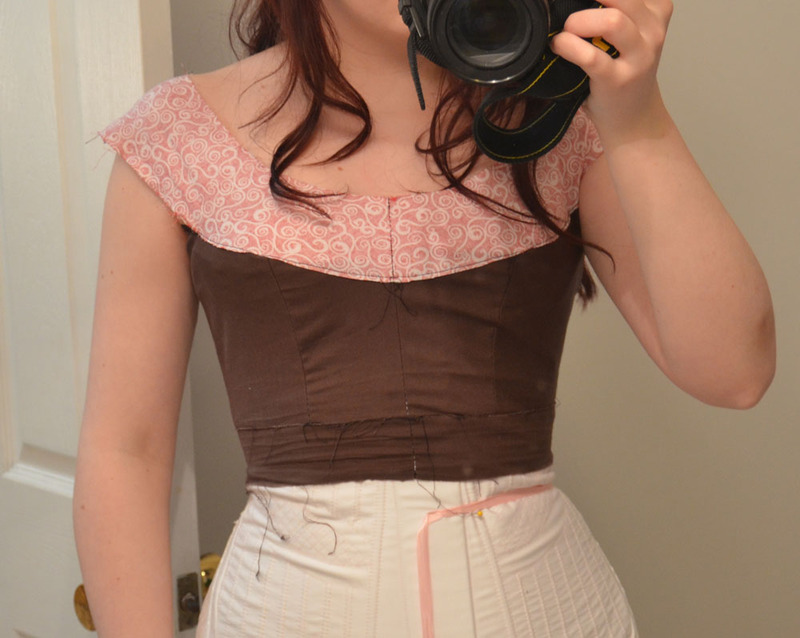 Once that was done I cut the bodice pattern out again, this time from muslin, which I was using as lining. 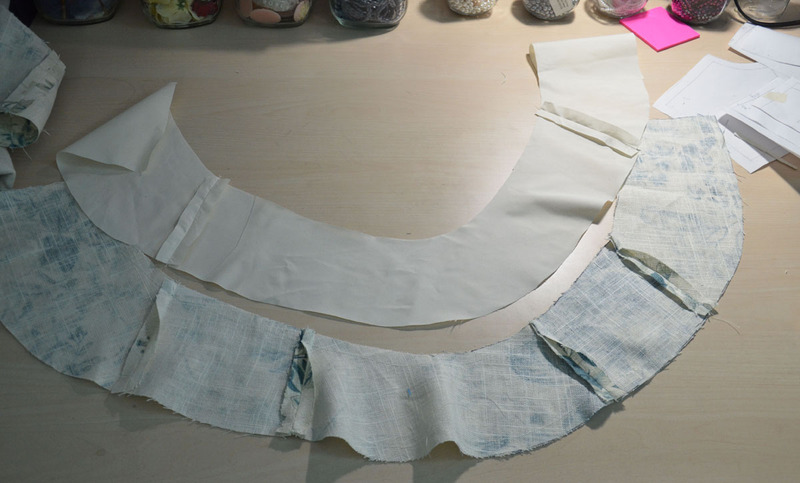 Both the muslin and linen bodices were assembled. 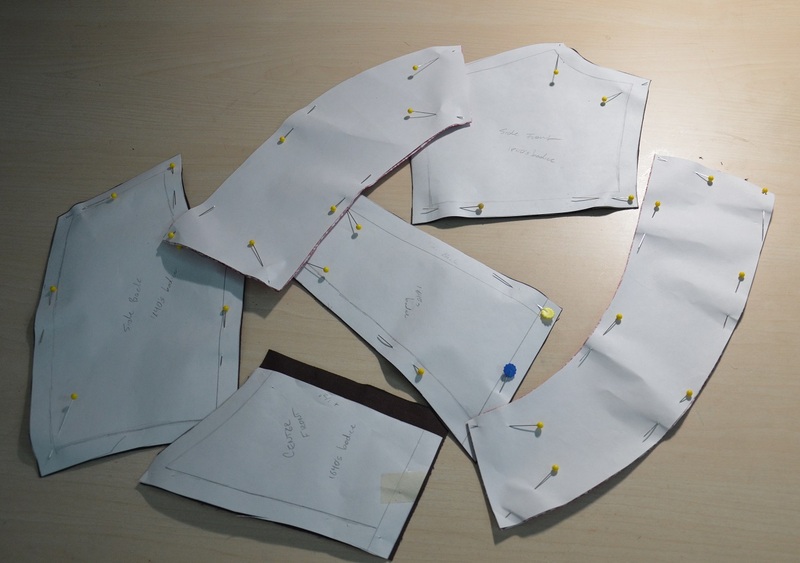 Then the pieces that create the neckline were cut out. These had to be completely hand sewed together to avoid any stitching showing through, it ended up being way more complicated then it should have been. 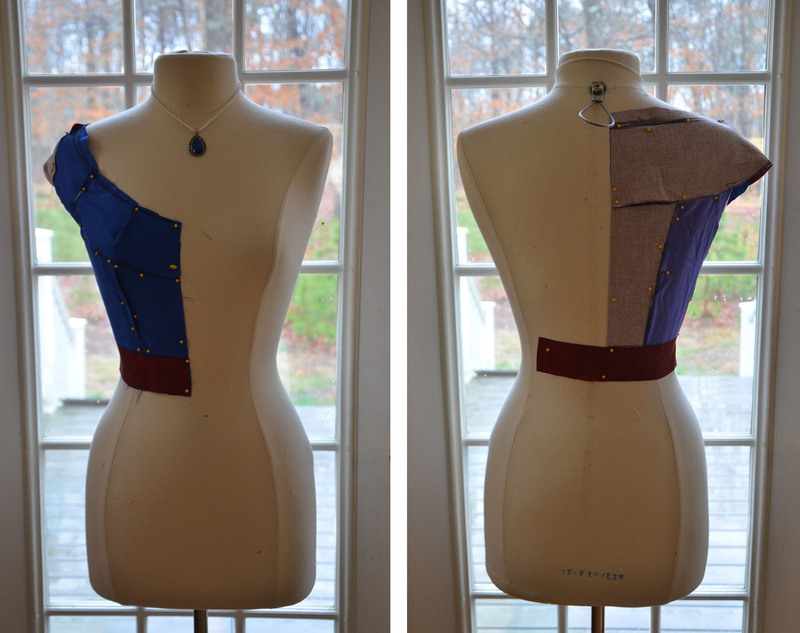 Once they were sewn together it was sewn onto the bodice, and that just about finishes that! It needed to be lined, but that couldn’t happen until the sleeves and skirt were sewn on. So we’ll move on to the skirt. The skirt was more complicated then it should have been, since it’s half pleated and half gathered. 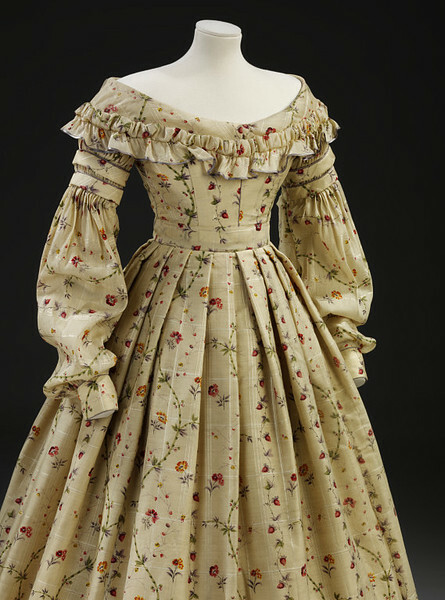 But regular pleats wouldn’t provide enough volume, so they had to be made wider. Since it was so complicated I made a lot of notes. 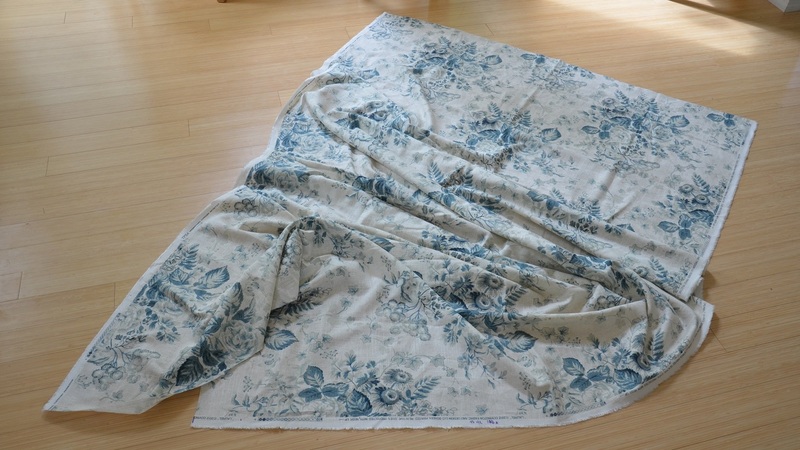 Then the skirt was cut out, one big rectangle! 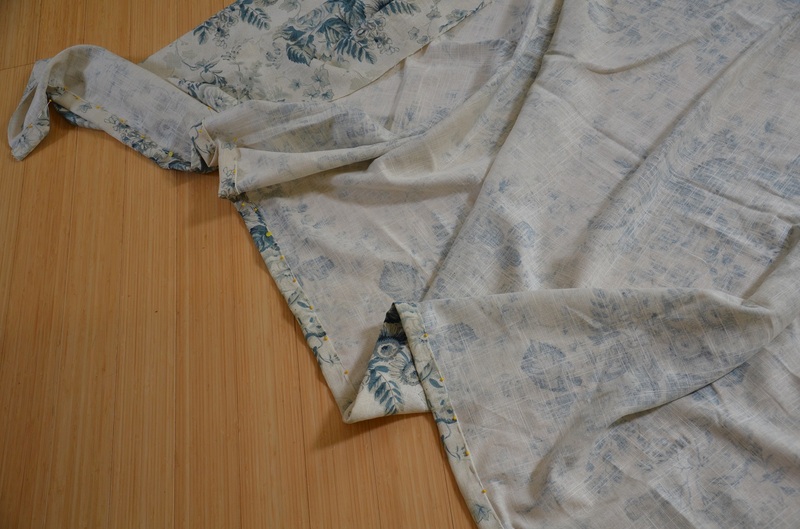 I hemmed the thing by hand – a one inch rolled hem. I think the skirt may still be too long, it needs to be shortened an inch, so that is something to look forward to. I marked out all the knife and accordion pleats with a sharpie. Then the skirt was pleated! I sewed the skirt to the waistband, and that bit was done! Looking back at photos of the original I realize what I thought was a waistband is most likely waist tape or a petticoat waistband showing through the thin material of the bodice. 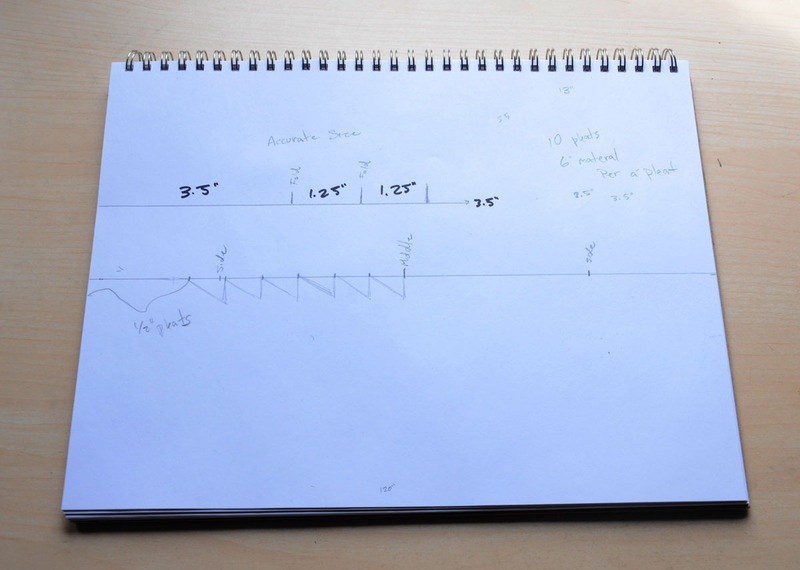 So cutting the pattern with a visible waistband was probably a mistake – oops. I do like the way it looks, though, so no regrets! The skirt doesn’t have a petticoat under it in this photo, so please ignore the super long hem and lack of volume. That’s it for now – next post in this project will be all about the sleeves. I love how you can just see something and make a pattern and then a beautiful dress. I can’t wait to see the finished product!